The capital was not specifically established; at the time, the Continental Congress met in Philadelphia. Many states had vaguely defined and surveyed borders; these are not noted as contested in the maps unless there was an active dispute. The borders of North Carolina were particularly poorly surveyed, its border with South Carolina having been done in several pieces, none of which truly matched the spirit of the charter, and its border with Virginia was only surveyed roughly halfway inland from the sea. Several northeastern states had overlapping claims: Connecticut, Massachusetts Bay, and New York all claimed land west of their accepted borders, overlapping with each other and with a sizable claim by Virginia. Of the three, only Connecticut seriously pursued its claims, while Virginia is considered to have had the most legitimate claim to the vast northwest, dividing it into counties and maintaining some limited control. 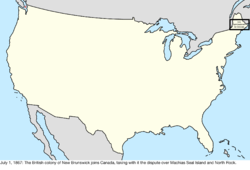 The entirety of the new United States was claimed by Great Britain, including Machias Seal Island and North Rock, two small islands off the northeast coast which remain disputed up to the present. 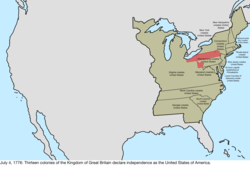 The Counties of New Castle, Kent, and Sussex, upon Delaware enacted a constitution, renaming itself the Delaware State. To avoid British forces who were advancing on Philadelphia, the Continental Congress began meeting in Baltimore. The Continental Congress returned to Philadelphia after the threat to it by British forces was ended. The Continental Congress continued to move away from Philadelphia, settling in York, Pennsylvania. The Continental Congress returned to Philadelphia following British withdrawal. 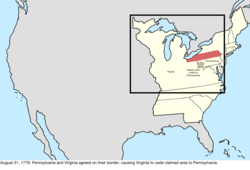 Virginia surrendered its claim to southwest Pennsylvania. North Carolina and Virginia surveyed their border further inland. Virginia's survey reached to the Tennessee River, but North Carolina's only went as far as the Cumberland Gap, and as the two surveys were roughly two miles apart, this created a thin area claimed by both states. While the border was intended to follow 36°30′ north, early surveying errors caused it to veer north of that, reaching a distance of seventeen miles off by the time it reached the Tennessee River. The State of Massachusetts Bay enacted a constitution, renaming itself the Commonwealth of Massachusetts. 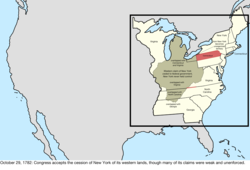 The federal government accepted the cession from New York of its western claims, which the state ceded on February 17, 1780; New York proclaimed its new western border to be a line drawn south from the western end of Lake Ontario. 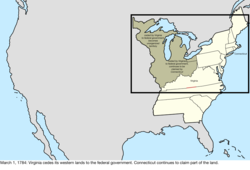 At its maximum interpretation, the state had claimed an area bounded by Lake Erie, Lake Huron and Lake Michigan; to the Illinois, Mississippi, and Tennessee Rivers; and north along the Appalachian Mountains, ending at the border with Pennsylvania. It is unclear from where this claim came; many sources state that New York had surrendered it, but very few elaborate on how it was obtained. One source states that it was a cession by the Six Nations, who had conquered much of the region. However, New York never seriously enforced these claims. The cession included the small tip of New York north of Pennsylvania, which came to be known as the Erie Triangle. 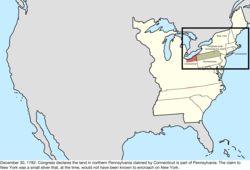 The Congress of the Confederation declared that the land that Connecticut claimed in northern Pennsylvania was part of Pennsylvania, thus attempting to end the Pennamite–Yankee War. 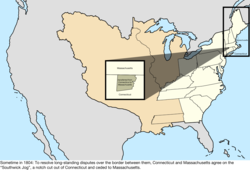 The claim was an extension of Connecticut's northernmost and southernmost borders westward, skipping New Jersey and New York, though as Connecticut's northern border was a few miles north of Pennsylvania's northern border, a small sliver of New York was also claimed. While conflict would continue for some time, this was the end of the formal claim by Connecticut. The Pennsylvania Mutiny of 1783, and the Pennsylvania government reaction to it, caused the Congress of the Confederation to leave Philadelphia for Princeton. The Congress of the Confederation reconvened in Annapolis. Virginia ceded its claims northwest of the Ohio River to the federal government. Connecticut continued to claim its western lands that had overlapped Virginia's cession. Great Britain recognized the independence of the United States, ending its claim to the country. [e] The treaty ended the American Revolutionary War, though military action had largely ended after the Franco-American victory at Yorktown on October 19, 1781. The northeastern border was defined as running from the headlands of the St. Croix River, but there were several options for that. The northwestern border was defined as a line running west from the northwestern point of the Lake of the Woods to the Mississippi River, but the river's source was south of that; maps universally show the line as running directly from the Lake of the Woods to the river's source, Lake Itasca. The border extending from Lake Superior towards the Lake of the Woods was poorly defined as starting from "Long Lake," which both sides interpreted to their advantage. Machias Seal Island and North Rock off the northeast coast remained disputed, as did Sugar Island off the Upper Peninsula of Michigan. The Peace of Paris also involved treaties with France and Spain, with Great Britain ceding the Floridas to Spain. During their ownership of West Florida, the British had moved its border north, and the cession to Spain appeared to apply to the full extent of the British colony. 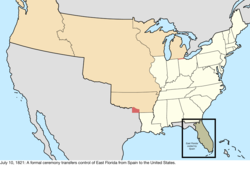 However, the British-American treaty granted the extension of West Florida to the United States, where it enlarged Georgia south to 31° north, indicating that only the original definition of West Florida was to be ceded to Spain. The local Spanish governors also made a move to occupy forts along the Mississippi River, with claims to everything south of the Tennessee River; it is unknown how official or strong these claims were, and they are not mapped as they are in conflict with the other Spanish claim involving the border of West Florida. The Congress of the Confederation moved for a short time to Trenton. The Congress of the Confederation moved to New York, and would settle there for five years. 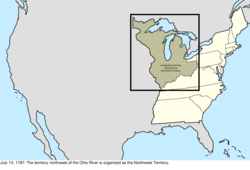 The Territory Northwest of the Ohio River, ceded earlier by Virginia, was organized and commonly became known as the Northwest Territory. 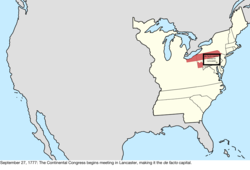 The land recently ceded by North Carolina was organized as the Territory South of the River Ohio, commonly known as the Southwest Territory. Per the Residence Act, the Congress of the United States relocated to Philadelphia for ten years until a federal district was built and ready. The District of Columbia, a federal district planned to house the federal government by 1800, was formed from land ceded by Maryland and Virginia, consisting of a 100 square mile diamond, with its southern tip at Jones Point, straddling the Potomac River. However, it was not yet given that name, being simply referred to as the federal district. In September 1791, the commissioners in charge of planning the city would term it the "Territory of Columbia", and various laws refer to a District of Columbia, but sometimes informally. The area does not appear to have been formally named "District of Columbia" until at least the organic act of 1871. 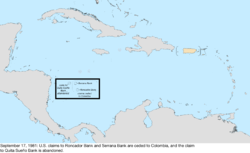 Since the name "Columbia" was used from very early on, and at least informally by the government, the map will use "District of Columbia" starting from this date. 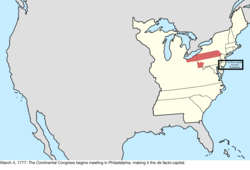 Pennsylvania purchased the Erie Triangle from the federal government. 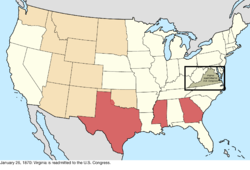 The Southwest Territory was admitted as the sixteenth state, Tennessee. Due to the Yazoo Land Fraud, an act authorized President John Adams to appoint commissioners to negotiate with Georgia about ceding its western land. 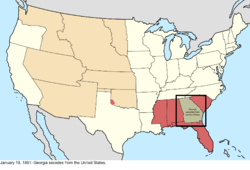 The act created Mississippi Territory from the southwestern quarter of Georgia in the region recently ceded by West Florida, while maintaining that Georgia still held rights over the territory. Commissioners agreed on the source of the St. Croix River, setting the lower portion of the border between Massachusetts and Great Britain and, thus, where the eastern north-south line originated. Connecticut ceded its Western Reserve to the federal government, which assigned it to the Northwest Territory. The act doing so was passed in Congress on April 28, 1800, and Connecticut approved it on this date. The Congress of the United States moved to Washington in the District of Columbia, now built and ready to be the capital. This was two weeks before the December 1 date established in the Residence Act; President John Adams urged Congress to move early in hopes of securing enough Southern votes to be re-elected, though this failed. The Kingdom of Great Britain united with the Kingdom of Ireland, renaming itself the United Kingdom. Georgia ceded its western half, known as the Yazoo Lands, to the federal government. [n] At the same time, the federal government ceded to Georgia the eastern portion of the land previously ceded by South Carolina, though in reality Georgia technically already held title to the land, as the description of the earlier cession was based on an erroneous understanding of geography. 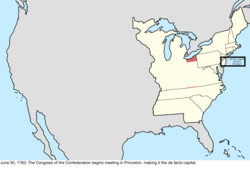 The southern half of the Northwest Territory, along with a thin sliver of Indiana Territory, was admitted as the seventeenth state, Ohio. 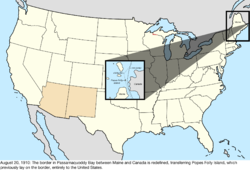 The remainder of the Northwest Territory was transferred to Indiana Territory. The western border was a line due north from the mouth of the Great Miami River; the federal definition of the northern border was a line drawn east from the southern tip of Lake Michigan, whereas the Ohio Constitution stated the line should run from the southern tip of Lake Michigan to the most northerly cape of Maumee Bay, essentially the western tip of Lake Erie. The confusion caused by these varying descriptions of the state's borders, combined with inaccurate knowledge of geography, as no one at the time knew just how far south Lake Michigan extended, would lead to the conflict over the Toledo Strip. The border between Tennessee and Virginia was resurveyed and established, ending the dispute over that part of the border. 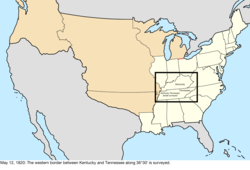 The border between Kentucky and Tennessee, despite following the original survey, remained vaguely defined. The United States purchased Louisiana from France. This is the date of the formal turnover in New Orleans; the purchase was completed on April 30, 1803. The transfer would be recognized in St. Louis in Upper Louisiana on March 10, 1804, known as Three Flags Day. The acquisition expanded the United States to the whole of the Mississippi River basin,[o] but the extent of what constituted Louisiana in the south was disputed with Spain: the United States claimed the purchase included the part of West Florida west of the Perdido River, whereas Spain claimed it ended at the western border of West Florida;[p] and the southwestern border with New Spain was disputed, as the United States claimed the Sabine River as the border, but Spain maintained it was the Calcasieu River and others. The "Southwick Jog" was transferred from Connecticut to Massachusetts, to put to rest long-standing disagreements over the border between the two states. The land between Tennessee and Mississippi Territory previously ceded by Georgia was assigned to Mississippi Territory. 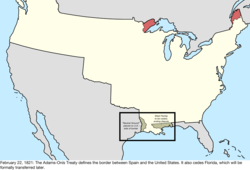 Orleans Territory was organized from the Louisiana Purchase south of 33° north, with the remainder being designated the District of Louisiana and placed under the jurisdiction of Indiana Territory. 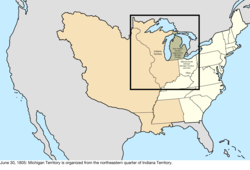 Michigan Territory was organized from Indiana Territory, north of a line east from the southern tip of Lake Michigan, and east of a line north from the lake's northern tip. The southeastern portion of the border technically conflicted with the definition of Ohio, which claimed the Toledo Strip north of that line; however, the exact position of Lake Michigan was not yet known. The District of Louisiana was organized as Louisiana Territory. 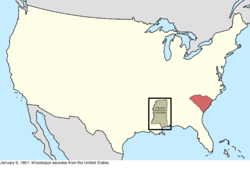 Most of Orleans Territory was admitted as the eighteenth state, Louisiana. 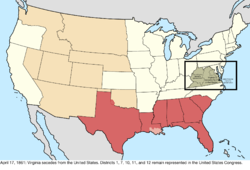 [r] The southeastern remainder presumably became unorganized territory, as it had no definition for a short time. The claimed portion of West Florida east of the Pearl River was assigned to Mississippi Territory, though the area around Mobile Bay remained under the control of Spanish Florida. The United States militarily occupied Mobile and the surrounding area up to the Perdido River in April 1813. 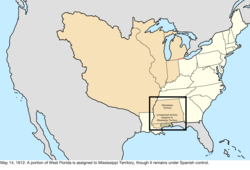 Since its name was now shared with the state of Louisiana, Louisiana Territory was renamed Missouri Territory. The remaining claimed portion of West Florida, west of the Pearl River, was added to Louisiana, following the assent of that state to an act passed by Congress on April 14, 1812. 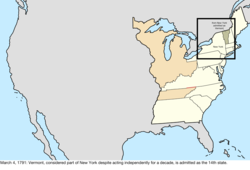 The southern part of Indiana Territory, along with small parts of Illinois Territory and Michigan Territory, were admitted as the nineteenth state, Indiana. [s] The remainder of Indiana Territory across Lake Michigan became unorganized territory. 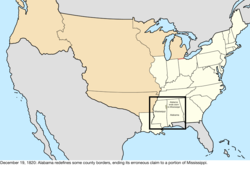 Mississippi Territory was admitted as the twentieth state, Mississippi. 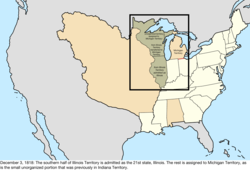 The half of Illinois Territory south of 42°30′ north was admitted as the twenty-first state, Illinois. 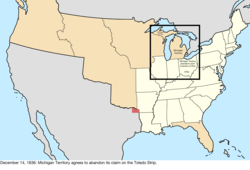 The remainder of the territory, along with the unorganized territory that was recently part of Indiana Territory, was assigned to Michigan Territory. 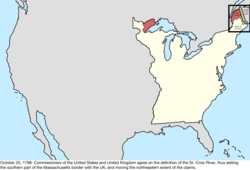 The Treaty of 1818 went into effect, setting 49° north as the border with the United Kingdom west of the Lake of the Woods, and also establishing the Oregon Country as a shared region with the United Kingdom. Oregon Country had no defined northern limit, but it can be assumed that it did not encroach much upon Russian-held lands; this map uses the later-established line at 54°40′ north for simplicity. 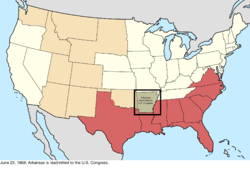 Alabama Territory was admitted as the twenty-second state, Alabama. 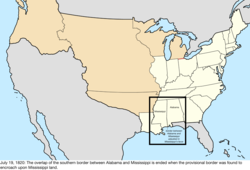 The statehood act provided for a survey of the southern part of the border with Mississippi, which was intended to be north-south, for adjustment if it was discovered to encroach upon Mississippi's established counties; it was later discovered to do so. As part of the Missouri Compromise, the District of Maine, the northern and separate part of Massachusetts, was admitted as the twenty-third state, Maine. This is the earliest known date of the name "Arkansas Territory" being officially used instead of "Arkansaw Territory". 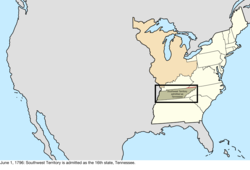 The border between Kentucky and Tennessee was established. To make up for the fact that the border between the Cumberland Gap and the Tennessee River veered north as much as 17 miles from 36°30′ north, a new survey was conducted starting at that latitude on the Mississippi River and moving east to the Tennessee River, hence guaranteeing this last bit of border would fit the original ideal. The new border placed the "Neutral Ground" in Louisiana. Florida was ceded to the United States, although the formal transfer would not happen until July. Arkansas Territory had created Miller County south of the Red River, and this area was now on the Spanish side of the border. However, as this was a change made solely by the territory, and not by the federal government, in this map it is considered a domestic dispute. With Spanish West Florida being ceded, the dispute between it and Alabama, Louisiana, and Mississippi was resolved. East Florida was formally transferred to the United States by Spain. West Florida was formally transferred to the United States by Spain. The former East Florida and West Florida were organized as Florida Territory. The half of Arkansas Territory west of a line south from a point 40 miles west of Missouri's western border was returned to unorganized territory. Michigan Territory gained a large parcel of land from unorganized territory, extending west to the Missouri River and White Earth River. 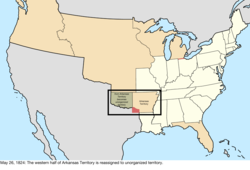 Arkansas Territory was admitted as the twenty-fifth state, Arkansas. 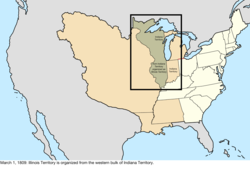 Wisconsin Territory was organized from the western bulk of Michigan Territory. 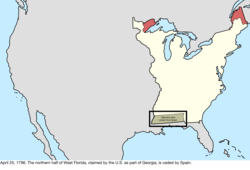 [y] The two large peninsulas between the Great Lakes remained in Michigan Territory; the upper peninsula was included in exchange for the territory abandoning its claim to the Toledo Strip. The territory initially rejected this plan, but would accept it on December 14. Michigan Territory agreed to abandon its claim to the Toledo Strip, ending its dispute with Ohio. 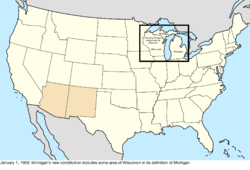 Michigan Territory was admitted as the twenty-sixth state, Michigan. The Platte Purchase transferred some land from unorganized territory to northwest Missouri, extending its northern border west to the Missouri River. 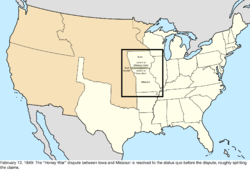 Iowa Territory was organized from Wisconsin Territory west of the Mississippi River. 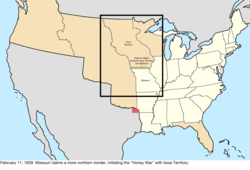 Missouri claimed an area north of its border with Iowa Territory, initiating the long dispute known as the Honey War. Surveying conducted along the border with Texas concluded that the area claimed by Arkansas for Miller County belonged to Texas. The Webster–Ashburton Treaty defined the border with the United Kingdom east of the Rocky Mountains. One source also mentions it very slightly altering the maritime boundary between Michigan and Wisconsin Territory. The treaty resolved the disputes over the northern borders of Maine and New Hampshire,[z] the northeastern border of Wisconsin Territory,[aa] and Sugar Island with Michigan. The border between New York and Vermont on the one side, and the United Kingdom on the other, was clarified by the treaty. In 1816, construction began on an unnamed fort nicknamed "Fort Blunder" on a peninsula in Lake Champlain that, while south of the surveyed border, was discovered to be north of 45° north, which was the border set by the Treaty of Paris and thus in British territory. Consequently, construction on the fort was abandoned. The Webster–Ashburton Treaty specified that section of the border was to follow the surveyed line, rather than the exact parallel, thus moving the fort's area into the United States, and a new fort, Fort Montgomery, would be built on the spot in 1844. As the earlier line was surveyed, even though it did not match the definition, it was deemed to be the legitimate border. 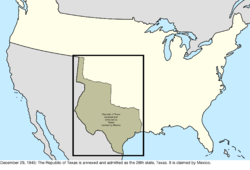 The Republic of Texas was annexed and admitted as the twenty-eighth state, Texas, extending the United States southwest to the Rio Grande. 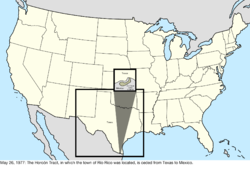 All of Texas was claimed by Mexico. While many sources state that Mexico recognized the independence of the eastern portion of Texas, the treaties were rejected by the Mexican government. Texas formally handed over sovereignty to the United States in a ceremony on February 19, 1846. 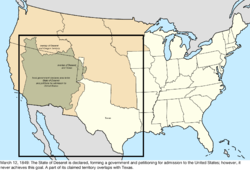 The annexation led to the beginning of the Mexican–American War a few months later. The Oregon Treaty established 49° north west of the Lake of the Woods as the continental border (so it did not include Vancouver Island) with land held by the United Kingdom. 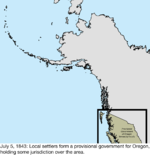 The sharing of Oregon Country ended, and the United States portion became unorganized territory. The treaty was vague on which strait should be the border between Vancouver Island and the continent, thus causing a dispute over ownership of the San Juan Islands. It specified "through the middle of the said channel and of Fuca Straits, to the Pacific Ocean". The portion of Iowa Territory south of 43°30′ north and east of the Big Sioux River was admitted as the twenty-ninth state, Iowa. The remainder became unorganized territory. 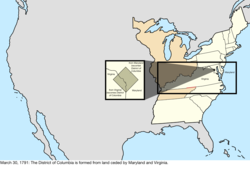 The District of Columbia retroceded Alexandria County back to Virginia. Congress passed the act on July 9, 1846, residents of Alexandria County were proclaimed by the president to have agreed to it on September 7, 1846, and Virginia took possession of the land on this date. 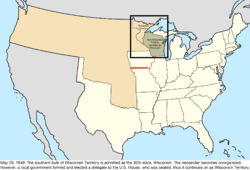 The southern bulk of Wisconsin Territory was admitted as the thirtieth state, Wisconsin. [ab] The remainder became unorganized territory. However, the citizens of the remainder decided to continue on with a civil government, and even elected a delegate to the United States House of Representatives who would be seated on January 15, 1849, essentially making this region a de facto continuation of Wisconsin Territory. 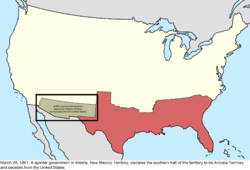 The Treaty of Guadalupe Hidalgo ended the Mexican–American War and ceded a large parcel of land from Mexico, consisting of its territories of Alta California and Santa Fe de Nuevo México, and its claim to Texas. [ac] Due to a disagreement over the southern border of Santa Fe de Nuevo México, a border dispute began. 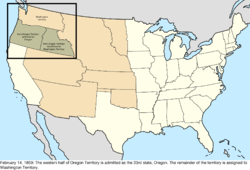 Oregon Territory was organized from the unorganized territory that was formerly part of Oregon Country. The boundary dispute between Iowa and Missouri known as the Honey War was resolved by the Supreme Court of the United States. The resulting border was the Sullivan Line that existed before the dispute, roughly splitting the two claims. 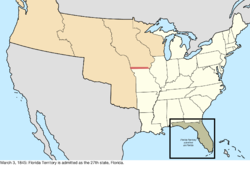 Minnesota Territory was organized from the region that had been operating as de facto Wisconsin Territory, and unorganized territory east of the Missouri and White Earth Rivers. 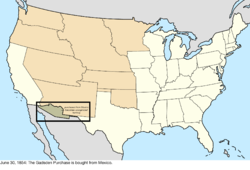 The western portion of the Mexican Cession was admitted as the thirty-first state, California. [ad] The portion of the remainder north of 37° north and west of the summit of the Rocky Mountains was organized as Utah Territory. Part of Utah Territory overlapped with the portion of Texas that would be purchased on December 13, 1850, but the law authorizing the purchase was passed on this day, so the borders of Utah Territory assumed the purchase will go through. The United Kingdom ceded less than one acre of underwater rock known as Horseshoe Reef in Lake Erie near Buffalo, New York for a lighthouse. It was surrounded by British waters, thus creating a form of enclave. The federal government purchased the western claims of Texas. 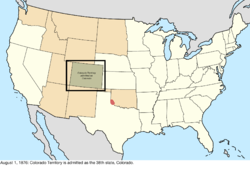 [ae] New Mexico Territory was organized from the part of this land east of the Rio Grande, along with the remaining unorganized territory from the Mexican Cession. 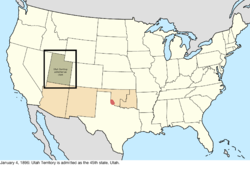 [af] New Mexico Territory included all of the area that had been governed under the Kearny Code. Washington Territory was organized from the half of Oregon Territory north of 46° north and the Columbia River. 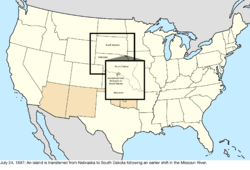 Kansas Territory was organized from unorganized territory north of 37° north, and Nebraska Territory was organized north of 40° north. Much of the remaining unorganized territory, east of 100° west, became known as Indian Territory, designated as a place to resettle Indian tribes. 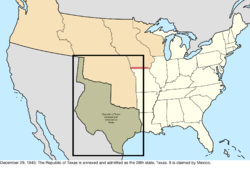 A small strip between the Texas Panhandle and Kansas Territory was unclaimed, due to falling south of Kansas Territory's border but north of 36°30′ north established in the Missouri Compromise as the northern limit of slavery, and thus Texas could not have it. This became known as the Public Land Strip, or sometimes "No Man's Land". The United States purchased a large parcel from Mexico known as the Gadsden Purchase, as it offered a much better route for a southern transcontinental railroad. [ag] This resolved the border dispute, since the disputed land was included in the purchase. 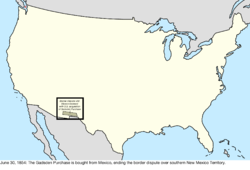 The recently obtained Gadsden Purchase was assigned to New Mexico Territory. Due to its inaccessibility from the rest of the state, Boston Corner was transferred from Massachusetts to New York. The eastern half of Minnesota Territory was admitted as the thirty-second state, Minnesota. [ah] The remainder became unorganized territory. The western half of Oregon Territory was admitted as the thirty-third state, Oregon. [ai] The remainder was transferred to Washington Territory. A team of surveyors created the "Middleton Offset," a small notch in the border between Kentucky and Tennessee. It is unknown exactly why this was done, though one theory is a local landowner wanted his property in Tennessee. Texas created Greer County, claiming part of Indian Territory based on a different understanding from the federal government of which fork of the Red River was the border between the two. 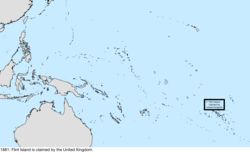 Atafu, Birnie Island, Butaritari, Caroline Island, Fanning Island, Flint Island, Gardner Island, Canton Island, Kingman Reef, Manihiki, Marakei, Nukunono, Palmyra Atoll, Penrhyn, Pukapuka, Rakahanga, Swains Island, Sydney Island, Vostok Island, and Washington Island were all claimed under the Guano Islands Act. Many additional islands were listed as bonded on this date, but based on the coordinates they were either phantoms or duplicates. In addition, Sarah Ann Island was claimed, which may have existed and would be sighted as late as 1917, but has since disappeared. In response to the election of Abraham Lincoln, South Carolina proclaimed its secession from the Union, withdrawing from the Congress of the United States. 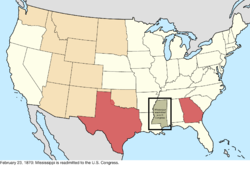 Mississippi proclaimed its secession from the Union, withdrawing from Congress. Florida proclaimed its secession from the Union, withdrawing from Congress. 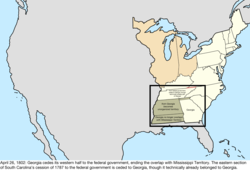 Alabama proclaimed its secession from the Union, withdrawing from Congress. Georgia proclaimed its secession from the Union, withdrawing from Congress. Louisiana proclaimed its secession from the Union, withdrawing from Congress. However, the 1st and 2nd congressional districts, around New Orleans, maintained representation in Congress. The bulk of Kansas Territory east of 25° west from Washington was admitted as the thirty-fourth state, Kansas. The remainder became unorganized territory. 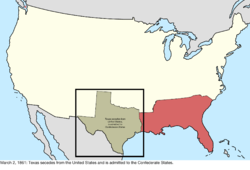 Texas proclaimed its secession from the Union and was admitted to the Confederate States, withdrawing from Congress. 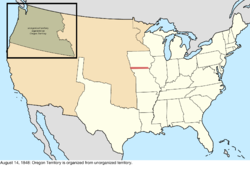 Dakota Territory was organized from Nebraska Territory and the unorganized territory north of it. [al] Nebraska Territory's western border was moved to 104° west, gaining small portions of Utah Territory and Washington Territory. Nevada Territory was organized from Utah Territory west of 39° west from Washington. Following the Battle of Fort Sumter and President Abraham Lincoln's call for troops to respond, Virginia proclaimed its secession from the Union, withdrawing from Congress. However, the 1st (along the Eastern Shore), 7th (near Washington, D.C.), and 10th, 11th, and 12th (in the northwest of the state) congressional districts maintained representation in Congress. 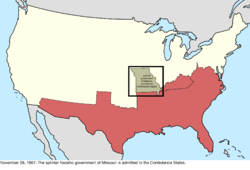 Arkansas proclaimed its secession from the Union, withdrawing from Congress. 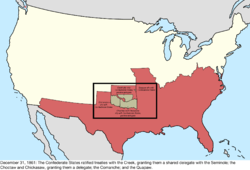 Arkansas was admitted to the Confederate States. North Carolina proclaimed its secession from the Union, withdrawing from Congress. 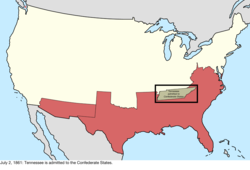 Tennessee proclaimed its secession from the Union, withdrawing from Congress. However, the 2nd, 3rd, and 4th congressional districts in the central part of the state maintained representation in Congress. The federal government recognized the Restored Government of Virginia in Wheeling as the legitimate government of Virginia. The slice of Utah Territory west of 38° west from Washington was transferred to Nevada Territory. 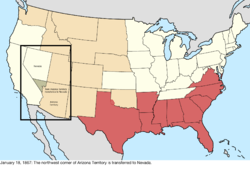 Arizona Territory was organized from the half of New Mexico Territory west of 32° west from Washington. Idaho Territory was organized from the parts of Dakota Territory and Nebraska Territory west of 104° west, and the half of Washington Territory east of the Snake River and a line north from the mouth of the Clearwater River. Due to disruption in voting and low turnout, no one was allowed to take the seats in the United States House of Representatives held by the Unionist areas of Louisiana, Tennessee, and Virginia, effectively expelling the states. 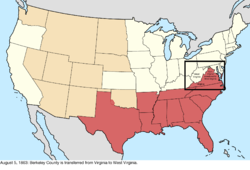 The northwestern counties of Virginia, represented by the Restored Government of Virginia in Wheeling, were split from the rest of Virginia and admitted to the Union as the thirty-fifth state, West Virginia. [an] The Restored Government of Virginia was relocated to Alexandria. Jefferson County was transferred from Virginia to West Virginia. Nevada Territory was admitted as the thirty-sixth state, Nevada. The slice of Utah Territory west of 37° west from Washington was transferred to Nevada. Tennessee was readmitted to Congress. The northwestern corner of Arizona Territory, west of the Colorado River and 37° west from Washington, was transferred to Nevada. The law transferring the land was approved May 5, 1866, but unlike the Utah Territory transfer of that day, this transfer was contingent on the state accepting it. 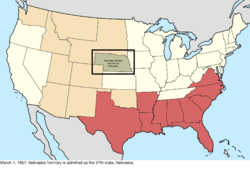 Nebraska Territory was admitted as the thirty-seventh state, Nebraska. Arkansas was readmitted to Congress. Florida was readmitted to Congress. North Carolina was readmitted to Congress. Louisiana and South Carolina were readmitted to Congress. 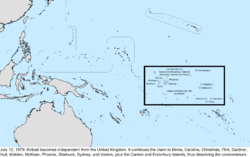 Caroline Island was claimed by the United Kingdom. Alabama was readmitted to Congress. Georgia was readmitted to Congress. 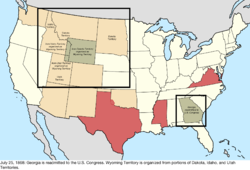 Wyoming Territory was organized from portions of Dakota, Idaho, and Utah Territories. 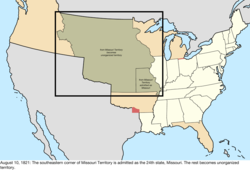 [ar] The territory would remain under the jurisdiction of the Dakota Territory until its own government was organized on May 19, 1869. The act organizing Wyoming Territory became law on this date, but it is unclear if the territory could be considered "organized" until May 19, 1869, as the act specifies it was not to take effect until a government is organized; however, all sources use this date as the creation, and most use it for the organization, of the territory. A tiny portion of the Dakota Territory was erroneously left behind on the western side of Wyoming Territory. Georgia was again expelled from Congress following failures of Reconstruction in the state. Virginia was readmitted to Congress. Mississippi was readmitted to Congress. Texas was readmitted to Congress. Georgia was again readmitted to Congress. 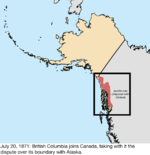 The North-Western Territory was transferred by the United Kingdom to Canada, thus transferring its portion of the Alaska boundary dispute. A small parcel was transferred from Dakota Territory to Nebraska following a sudden change in course of the Missouri River. The small portion of Dakota Territory that was left behind when Wyoming Territory was created was transferred to Montana Territory. Colorado Territory was admitted as the thirty-eighth state, Colorado. The area between 43° north and the Keya Paha and Niobrara Rivers was transferred from Dakota Territory to Nebraska. The act was passed in Congress on March 28 and accepted by the Nebraska legislature on this date. Dakota Territory was split in half along the "seventh standard parallel north", a few miles south of 46° north, and admitted as the thirty-ninth state, North Dakota, and the fortieth state, South Dakota. Montana Territory was admitted as the forty-first state, Montana. Washington Territory was admitted as the forty-second state, Washington. Idaho Territory was admitted as the forty-third state, Idaho. 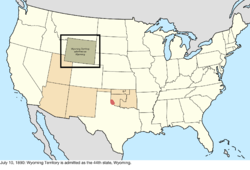 Wyoming Territory was admitted as the forty-fourth state, Wyoming. 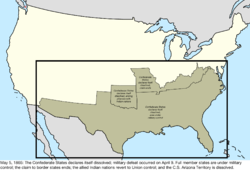 Per a treaty with the Cherokee, the federal government purchased the Cherokee Outlet in the Indian Territory and opened it to settlement, transferring it to Oklahoma Territory as provided in the Oklahoma Organic Act. 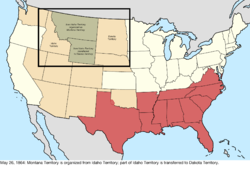 Utah Territory was admitted as the forty-fifth state, Utah. The dispute between the federal government, on behalf of Oklahoma Territory, and Texas over Greer County was resolved in favor of the federal claim. Due to an earlier shift in the course of the Missouri River, an island was transferred from Nebraska to South Dakota. The president of the First Philippine Republic, Emilio Aguinaldo, was captured, and the republic was dissolved. 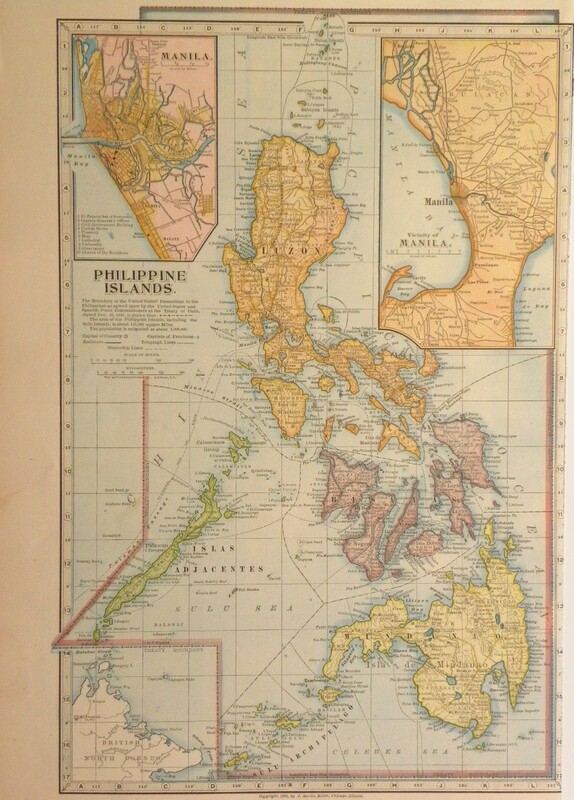 The islands of Cagayan de Sulu and Sibutu, and their associated islands, were purchased from Spain and assigned to the Philippines. 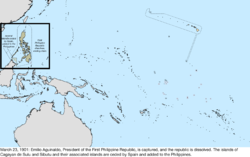 The borders specified in the Treaty of Paris of 1898 had excluded these islands; the new treaty simply ceded "any and all islands belonging to the Philippine Archipelago". The border between Arkansas and Indian Territory was slightly adjusted near Fort Smith, Arkansas, transferring a small amount of land on the east side of the Poteau River to Arkansas. Indian Territory and Oklahoma Territory were combined and admitted as the forty-sixth state, Oklahoma. The new Constitution of Michigan included some area of Wisconsin within its definition of Michigan. A boundary treaty with the United Kingdom on behalf of Canada addressed a slight uncertainty in the maritime border in Passamaquoddy Bay between Maine and Canada. The border was adjusted to run east of Pope's Folly Island, which previously lay on the border line, and had been the subject of some debate for many years. 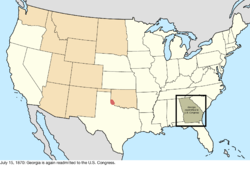 New Mexico Territory was admitted as the forty-seventh state, New Mexico. 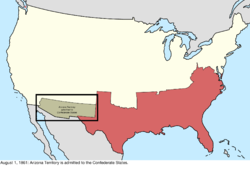 Arizona Territory was admitted as the forty-eighth state, Arizona. New Mexico filed suit in the Supreme Court against Texas over the "Country Club Dispute," questioning whether the present course or the 1850 course of the Rio Grande should be their border. Minnesota and Wisconsin exchanged islands in the Mississippi River: Island Seventytwo was transferred to Winona, Minnesota, and Barron's Island was transferred to La Crosse, Wisconsin. The "Wedge" dispute between Delaware and Pennsylvania was resolved in Delaware's favor. The disputed land had generally been administered by Delaware, even electing a member of the Delaware legislature in the mid-19th century, but federal maps had included the land as part of Pennsylvania at least as late as 1900. The states had agreed on a resolution, and it was affirmed by an act of Congress on this date. Some sources, both contemporary and modern, note that, in the original process of resurveying the border in 1892, a very thin, horn-shaped region along the arc was transferred from Delaware to Pennsylvania; however, no federal maps found reflect this, and it is unclear if this transfer actually occurred. Michigan expanded its claim to Wisconsin territory, though Wisconsin never lost control over the area. The Supreme Court of the United States resolved the conflict between Michigan and Wisconsin in the favor of Wisconsin. The Supreme Court of the United States defined the border between Michigan and Wisconsin, transferring all islands south of the Quinnesec Falls on the Menominee River to Wisconsin, and all islands north of the falls to Michigan; it is unknown specifically which islands were transferred in this fashion. However, an error in the border description introduced a small overlap between the two states over several islands in Lake Michigan north of the Door Peninsula. 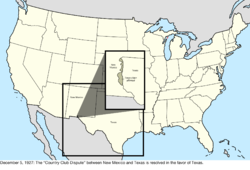 The "Country Club Dispute" between New Mexico and Texas was resolved in Texas's favor. The de jure overlap between Michigan and Wisconsin was resolved by the Supreme Court of the United States. Kansas and Missouri exchanged small portions of land along the Missouri River, due to shifts in the river following a flood in 1944. 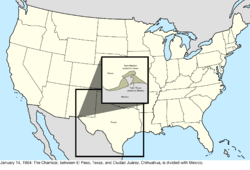 The Chamizal, a tract of land between El Paso, Texas, and Ciudad Juárez, Chihuahua, was divided between the United States and Mexico. Several parcels were exchanged between Texas and Mexico along the Rio Grande in areas near Presidio and Hidalgo, Texas, including the Horcón Tract, on which the town of Río Rico was located, and Beaver Island near Roma, Texas. In addition, Mexico ceded 823 acres (3.33 km2) to the U.S., while the U.S. ceded 2,177 acres (8.81 km2) to Mexico, primarily to straighten sections of the Rio Grande for flood control. 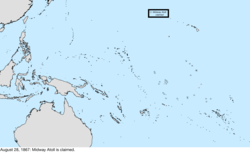 The United States recognized the sovereignty of Kiribati over Birnie Island, Canton Island, Caroline Island, Christmas Island, Enderbury Island, Flint Island, Gardner Island, Hull Island, Malden Island, McKean Island, Phoenix Island, Starbuck Island, Sydney Island, and Vostok Island. 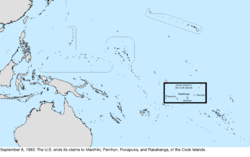 The United States recognized the sovereignty of Tuvalu over Funafuti, Nukufetau, Nukulaelae, and Niulakita. The Banco Convention of 1905 between the United States and Mexico allowed, in the event of sudden changes in the course of the Rio Grande (as by flooding), for the border to be altered to follow the new course. The sudden changes often created bancos, land left behind when curves in the river are cut off by rapid erosion of the channel or are intentionally cut to re-align it. When these bancos are created, the International Boundary and Water Commission investigates if land previously belonging to the United States or Mexico is to be considered on the other side of the border. In all cases of these adjustments under the 1905 convention, which occurred on 37 different dates from 1910 to 1976, the transferred land was minuscule (ranging in size from 1 acre to 646 acres) and uninhabited. Wikimedia Commons has media related to snapshots of the country at any given moment. ^ The borders of the country followed the colonial borders; for simplicity, the maps use the borders defined in the 1783 Treaty of Paris. The only substantive difference between the borders before and after the Treaty of Paris is the southwest border: when Great Britain had ownership over West Florida, they had moved its border north, to a line east from the mouth of the Yazoo River, and that area thus did not belong to Georgia; the treaty granted the area between this and 31° north to the United States. ^ The New Hampshire towns petitioning to join Vermont were: Apthorp (now Littleton), Bath, Canaan, Cardigan (now Orange), Cornish, Dresden (now part of Hanover), Enfield, Franconia, Gunthwaite (now Lisbon), Haverhill, Landaff, Lebanon, Lyman, Lyme, Orford, and Piermont. The specific extent of the towns annexed is unknown, as township borders were often delineated only when a dispute arose; the map uses the common interpretation. ^ The New Hampshire towns petitioning to join Vermont were: Acworth, Alstead, Bath, Cardigan (now Orange), Charlestown, Chesterfield, Claremont, Cornish, Croydon, Dorchester, Dresden, Franconia, "Gilsom" (likely Gilsum), Grafton, Grantham, Gunthwaite (now Lisbon), Hanover, Haverhill, Hinsdale, Landaff, Lancaster, Lebanon, "Leinster" (possibly Lempster), Lincoln, Lyman, Lyme, Marlow, Newport, Piermont, Plainfield, Richmond, Saville (now Sunapee), Surry, Walpole, and Westmoreland. The specific extent of the towns annexed is unknown, as township borders were often delineated only when a dispute arose; the map uses the common interpretation. ^ The New York towns petitioning to join Vermont were: "Black-Creek" (unknown; possibly is or is near Hebron), Cambridge, Fort Edward, Granville, "Greenfield" (unknown; there is a town named Greenfield but it lies west of the Hudson River, which was explicitly the western extent of the West Union), Hoosick, Kingsbury, "Little Hoosack" (unknown; presumably near Hoosick), Saratoga, "Scorticook" (possibly Schaghticoke), Skeensborough (now Whitehall), and "Upper-White-Creek" (probably White Creek). The specific extent of the towns annexed is unknown, as township borders were often delineated only when a dispute arose; the map uses the common interpretation. ^ The treaty established the boundaries of the new country, from the Bay of Fundy: up the "St. Croix River" (which river this referred to was disputed) to its source; north to the height of the land (the "Northwest Angle of Nova Scotia"); along the height of the land to the "northwesternmost Head" of the Connecticut River (which source this referred to was disputed); down that to 45° north; west to the St. Lawrence River; up that to the Great Lakes, through Lake Ontario, the Niagara River, Lake Erie, the Detroit River, Lake St. Clair, St. Clair River, Lake Huron, and Lake Superior; to "Long Lake" (which lake this referred to was disputed) towards the Lake of the Woods; to the northwest angle of the Lake of the Woods; then west to the Mississippi River. However, the Lake of the Woods was north of the source of the Mississippi River; maps universally show this undefined border as a straight line, nearly straight south, between the two points. From there, it followed the Mississippi River down to 31° north; east to the Chattahoochee River; down that to the Flint River; a line from there to the source of the St. Mary's River; then down that to the Atlantic Ocean. ^ The boundaries of Frankland were never defined; the map uses the common depiction of it. ^ Massachusetts's ceded claim was a strip of land west of New York and Pennsylvania stretching to the Mississippi River, bounded by the latitudes of Massachusetts Bay Colony's original charter: on the north by a line west from one league north of Lake Winnipesaukee, and on the south by a line west from Massachusetts' southwest corner. ^ Connecticut's ceded claim was a strip of land west of 120 miles west of Pennsylvania (the western border of its Western Reserve) stretching to the Mississippi River, bounded by 41° north and the southern edge of Massachusetts's western claim, roughly 42°2′ north. 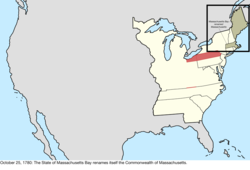 ^ Massachusetts's ceded claim was the portion of New York 82 miles west of where the Delaware River left New York, to an unclear western boundary, with one source saying it was as far as one mile east of the Niagara River. 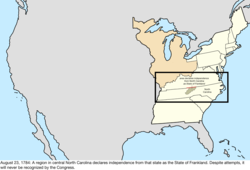 ^ The new North Carolina–federal border was, from the north, southwest along various ridges of the Great Smoky Mountains; however, issues caused surveyors to eventually run a line roughly due south rather than continue along the ridge. ^ The new New York–Vermont border was, from the north: Lake Champlain, the Poultney River, then south following borders of townships. ^ The new Kentucky–Virginia border was, from the south: north along the Cumberland Mountains and Pine Mountain to the Russell Fork; northeast to the Tug Fork; then down that to the Big Sandy River and to the Ohio River. ^ The new Indiana Territory–Northwest Territory border was, from the south, a line from the mouth of the Kentucky River to Fort Recovery, then north. ^ The new Georgia–federal border was, from the south, up the Chattahoochie River to its great bend (near West Point), then a line from there towards and past Nickajack. The border's description said it would go until it reached the Tennessee River, and follow that up the river to Tennessee, but the river lay entirely within Tennessee. ^ There was some question as to whether the purchase also included the basins of the Missouri River and the Red River of the North, but the question was not relevant before the Treaty of 1818 definitively settled the border. Maps universally show the purchase including the Missouri River basin but excluding the Red River basin. ^ The western border of West Florida was a series of waterways, mainly the Mississippi, Iberville, and Amite Rivers, and Lakes Pontchartrain and Maurepas. 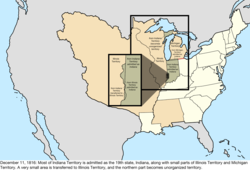 ^ The new Illinois Territory–Indiana Territory border was, from the south, the Wabash River up to Post Vincennes, then north. ^ The northwestern remainder of Orleans Territory presumably rejoined Louisiana Territory, as its extent was still vaguely defined. ^ Indiana was defined as the territory north of the Ohio River and east of the Wabash River, but while the territory's line turned north at Post Vincennes, the state's border continued up the Wabash until it reached the point where a line drawn north from Post Vincennes would last intersect the river as it weaved back and forth. The northern border of the state was a line east from 10 miles north of the southern tip of Lake Michigan, until it reached the meridian that formed Ohio's western border, which was a line drawn north from the mouth of the Great Miami River. 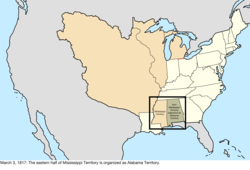 ^ The new Alabama Territory–Mississippi Territory border was, from the north: up the Tennessee River to Bear Creek (around today's Pickwick Lake); a line to the northwestern corner of Washington County, Mississippi Territory; then south. 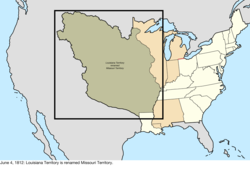 ^ The new Arkansaw Territory–Missouri Territory border was, from where the Mississippi River meets 36° north: west to the St. Francis River, up that to 36°30′ north, then west. 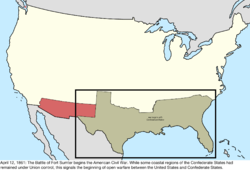 ^ The new border was, from the Gulf of Mexico: up the Sabine River to 32° north; north to the Red River; up that to 100° west; north to the Arkansas River; up that to its source; north to 42° north; then west to the Pacific Ocean. 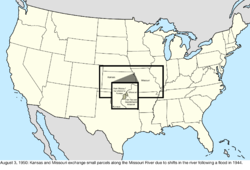 ^ The new Missouri–federal border was, from the mouth of the Des Moines River: up the river to a point west of the Des Moines Rapids on the Mississippi River, west to a point north of the mouth of the Kansas River, then south. ^ The new Michigan Territory–Wisconsin Territory border was, from Lake Superior: up the Montreal River to Lac Vieux Desert; a line to the source of the Menominee River; then down that to Green Bay. However, this definition was impossible: The Montreal River ended long before it reached Lac Vieux Desert. The issue would be resolved in 1850. ^ The new northeastern border was, from Passamaquoddy Bay: up the St. Croix River to its source; north to the St. John River; up that to the St. Francis River; up that to its source outlet at Lake Pohenegamook; southwest to the northwest branch of the St. John River; a line from there to where the St. John River crosses 46°25’ north; up the river to its source; along the highlands to the source of Halls Stream, then down that to 45° north. ^ The new northern border was, from Lake Superior: up the Pigeon River to the many lakes and rivers of the Boundary Waters, eventually reaching the Rainy River; then down that to the Lake of the Woods. ^ The new Wisconsin–Wisconsin Territory border was, from Lake Superior: up the St. Louis River to its first rapids; south to the St. Croix River; then down that to the Mississippi River. ^ The new international border was, from the Rio Grande: along the southern and western border of New Mexico until it meets the Gila River; down that to the Colorado River; then a line to a point one league south of the port of San Diego. However, the southern border of New Mexico was in question, with the US claim being 31°52′ north, and the Mexican claim being 32°22′ north. ^ The new California–federal border was, from the north: south along 120° west to 39° north; a line to where the Colorado River intersects 35° north; then down the Colorado River. ^ The new Texas–federal border was, from the south: up the Rio Grande to 32° north; east to 103° west; north to 36°30′ north; then east. ^ The borders of New Mexico Territory were, from where its border with Texas ended at 36°30′ north and 103° west: north to 38° north; west to the summit of the San Juan Mountains (called then the Sierra Madre); south along the ridge to 37° north; then west. ^ The new international border was, starting from where the Rio Grande crosses 31°47′ north: west 100 miles; south to 31°20′ north; west to 111° west; a line to a point on the Colorado River 20 miles below the mouth of the Gila River; then up the Colorado River. ^ The new Minnesota–federal border was, from the north: up the Red River to the Bois de Sioux River; up that to Lake Traverse and its southern tip; a line to Big Stone Lake and through that to its southern tip; then south. ^ The new Oregon–Washington Territory border was, from the north, up the Snake River to the mouth of the Owyhee River, then south. 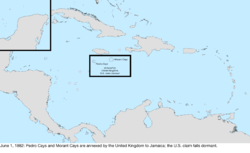 ^ The claimed borders of Jefferson Territory were between 37° north, 43° north, 102° west, and 110° west. 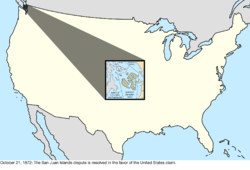 ^ The borders of Colorado Territory were parallels 32° north, 37° north, and Washington meridians 25° west and 32° west. 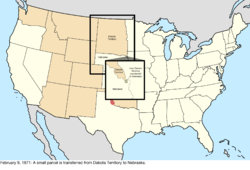 ^ The new Nebraska Territory–Dakota Territory border was, from the east: up the Missouri River to the Niobrara River; up that to the Keya Paha River; up that to 43° north; then west. ^ The decree transferred land from the left bank of the Blackstone River to Rhode Island, including what is now East Providence, in exchange land around Fall River being transferred to Massachusetts. ^ The Virginia counties that became West Virginia were: Barbour, Boone, Braxton, Brooke, Cabell, Calhoun, Clay, Doddridge, Fayette, Gilmer, Greenbrier, Hampshire, Hancock, Hardy, Harrison, Jackson, Kanawha, Lewis, Logan, McDowell, Marion, Marshall, Mason, Mercer, Monongalia, Monroe, Morgan, Nicholas, Ohio, Pendleton, Pleasants, Pocahontas, Preston, Putnam, Raleigh, Randolph, Ritchie, Roane, Taylor, Tucker, Tyler, Upshur, Wayne, Webster, Wetzel, Wirt, Wood, and Wyoming. ^ The new Idaho Territory–Montana Territory border was, from the north: south along 39° west from Washington to the crest of the Bitterroot Range and the Rocky Mountains; along that to 44°30′ north; east to 34° west from Washington; north to 45° north; then east. 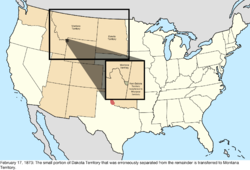 ^ The new Dakota Territory–Idaho Territory border was, from the south: north along 33° west from Washington to the crest of the Rocky Mountains, then northwest along that to the new tripoint with Montana Territory. ^ The borders of the Department of Alaska were, from the Dixon Entrance: Up the Portland Channel to 56° north; then along the "summit of the mountains situated parallel to the coast" (the definition of which was disputed) to 141° west; then north. ^ The borders of Wyoming Territory were parallels 41° north and 45° north, and Washington meridians 27° west and 34° west. 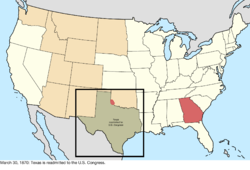 ^ The new Oklahoma Territory–federal border was, from where the Red River meets 98° west: north to the Canadian River; down that to Seminole land; north along that border to the North Canadian River; down that to Creek land; north and east along that border to 96° west; then north. This omits the Cherokee Outlet, whose complex borders separated the main portion of Oklahoma Territory from the former Public Land Strip. ^ a b c d e f g h i j k l m n o p Moore, John Bassett (1906). "A Digest of International Law as Embodied in Diplomatic Discussions, Treaties and Other International Agreements, International Awards, the Decisions of Municipal Courts, and the Writings of Jurists and Especially in Documents, Published and Unpublished, Issued by Presidents and Secretaries of State of the United States, the Opinions of the Attorneys-General, and the Decisions of Courts, Federal and State". Washington, DC: U.S. Government Printing Office. pp. 566–580. Archived from the original on May 1, 2016. ^ Ryden, George Herbert. 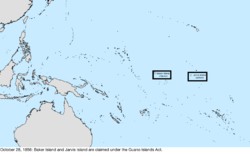 The Foreign Policy of the United States in Relation to Samoa. New York: Octagon Books, 1975. ^ http://www.vinow.com/general_usvi/history/ Vinow.com. 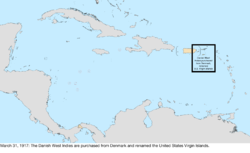 Virgin Islands History. Retrieved January 18, 2018. ^ a b Exec. Order No. 11021 (July 1, 1962; in English) President of the United States. Retrieved on April 10, 2015. ^ "Declaration of Independence: A Transcription". National Archives and Records Administration. Retrieved September 7, 2017. ^ "Delaware Government Facts & Symbols". Government of Delaware. Archived from the original on January 9, 2017. Retrieved January 16, 2017. ^ Hampshire, New (1824). The Laws of the State of New Hampshire. pp. 239–240. Retrieved January 16, 2017. ^ "Rhode Island declares independence". History Channel. Archived from the original on January 18, 2017. Retrieved January 16, 2017. ^ a b c d e f g h i j k l "Nine Capitals of the United States". U.S. Senate. Archived from the original on March 20, 2016. Retrieved March 19, 2016. ^ a b c d e f g "8 Forgotten Capitals of the United States". History. Archived from the original on January 26, 2017. Retrieved March 12, 2017. ^ "The North Carolina – South Carolina Border Surveys – 1730 to 1815". Archived from the original on March 4, 2016. Retrieved December 30, 2015. ^ Kelly, Stephen R. (August 23, 2014). "How the Carolinas Fixed Their Blurred Lines". The New York Times. Archived from the original on August 31, 2014. Retrieved December 30, 2015. ^ O'Connor, Joe (November 27, 2012). "Puffin Wars: The island paradise at centre of last Canada-U.S. land dispute". National Post. Retrieved April 1, 2019. ^ "Constitution of Delaware". Avalon Project. Yale Law School. 1776. Archived from the original on July 9, 2009. Retrieved June 10, 2009. ^ "Constitution of Pennsylvania". Avalon Project. Yale Law School. 1776. Archived from the original on January 26, 2017. Retrieved January 16, 2017. ^ Court, New Hampshire (Colony) Probate (1877). Provincial and State Papers relating to New Hampshire. pp. 242–246. Retrieved January 16, 2017. ^ a b c d "The Historical Geography of Vermont". Archived from the original on January 12, 2016. Retrieved January 24, 2016. ^ a b c d "East Union". The Vermont Encyclopedia. University Press of New England. 2003. p. 111. ISBN 978-1-58465-086-7. 1584650869. ^ Crumrine, Boyd (1902). "Boundary Controversy between Pennsylvania and Virginia; 1748–1785". Annals of Carnegie Museum. 1: 505–568. Retrieved August 20, 2017. ^ a b c "Virginia-Tennessee Border". Archived from the original on February 6, 2016. Retrieved January 4, 2016. ^ "Articles of Confederation". The Avalon Project at Yale Law School. Archived from the original on October 29, 2015. Retrieved October 31, 2015. ^ a b Vermont State Papers, pp. 136–137: "Agreeably to the recommendation of the committees, the Legislature of Vermont was adjourned to the first Wednesday of April ; at which time, it met at Windsor, and the union of the grants, east and west of Connecticut river, was consummated"
^ a b "West Union". The Vermont Encyclopedia. University Press of New England. 2003. p. 319. ISBN 978-1-58465-086-7. 1584650869. ^ "Virginia's Cession of the Northwest Territory". Archived from the original on August 17, 2016. Retrieved June 21, 2016. ^ Spencer, Jesse Ames (1912). The United States: its beginnings, progress and modern development, Volume 3. Retrieved January 14, 2016. ^ Gnichtel, Frederick W. (1921). "The "Pennamite Wars" and the Trenton Decree of 1782". Proceedings of the New Jersey Historical Society. 6. Retrieved November 8, 2015. ^ Worthing C. Ford; et al. (eds.). Journals of the Continental Congress, 1774–1789. pp. Vol. 26, pp. 112–121. ^ a b Treaty of Paris, 1783 Archived May 15, 2007, at the Wayback Machine; International Treaties and Related Records, 1778–1974; General Records of the United States Government, Record Group 11; National Archives. ^ McGee, Gentry Richard (1911). A History of Tennessee from 1663 to 1914: For Use in Schools. pp. 95–99. Retrieved December 29, 2015. ^ Williams, Samuel C. (1933). History of the Lost State of Franklin. p. 30. ^ a b c Schlueter, Roger (September 8, 2016). "The state that almost was an original colony". Belleville News-Democrat. Archived from the original on September 9, 2016. Retrieved March 13, 2017. ^ Northwest Ordinance Archived March 16, 2013, at the Wayback Machine, July 13, 1787; (National Archives Microfilm Publication M332, roll 9); Miscellaneous Papers of the Continental Congress, 1774–1789; Records of the Continental and Confederation Congresses and the Constitutional Convention, 1774–1789, Record Group 360; National Archives. ^ Worthington C. Ford; et al. (eds.). Journals of the Continental Congress, 1774–1789. 33. pp. 466–477. ^ "Ratification of the Constitution by the State of Delaware; December 7, 1787". The Avalon Project at Yale Law School. Archived from the original on December 20, 2015. Retrieved October 31, 2015. ^ "Ratification of the Constitution by the State of Pennsylvania; December 12, 1787". The Avalon Project at Yale Law School. Archived from the original on November 5, 2015. Retrieved October 31, 2015. ^ "Ratification of the Constitution by the State of New Jersey; December 18, 1787". The Avalon Project at Yale Law School. Archived from the original on September 23, 2015. Retrieved October 31, 2015. ^ "Ratification of the Constitution by the State of Georgia; January 2, 1788". The Avalon Project at Yale Law School. Archived from the original on December 20, 2015. Retrieved October 31, 2015. ^ "Ratification of the Constitution by the State of Connecticut; January 8, 1788". The Avalon Project at Yale Law School. Archived from the original on November 7, 2015. Retrieved October 31, 2015. ^ "Ratification of the Constitution by the State of Massachusetts; February 6, 1788". The Avalon Project at Yale Law School. Archived from the original on February 9, 2016. Retrieved October 31, 2015. ^ "Ratification of the Constitution by the State of Maryland; April 28, 1788". The Avalon Project at Yale Law School. Archived from the original on July 10, 2015. Retrieved October 31, 2015. ^ "Ratification of the Constitution by the State of South Carolina; May 23, 1788". The Avalon Project at Yale Law School. Archived from the original on November 8, 2015. Retrieved October 31, 2015. ^ "Ratification of the Constitution by the State of New Hampshire; June 21, 1788". The Avalon Project at Yale Law School. Archived from the original on November 5, 2015. Retrieved October 31, 2015. ^ "Ratification of the Constitution by the State of Virginia; June 26, 1788". The Avalon Project at Yale Law School. Archived from the original on August 22, 2015. Retrieved October 31, 2015. ^ "Ratification of the Constitution by the State of New York; July 26, 1788". The Avalon Project at Yale Law School. Archived from the original on October 24, 2015. Retrieved October 31, 2015. ^ Williams, Samuel C. (1933). History of the Lost State of Franklin. p. 230. ^ "Ratification of the Constitution by the State of North Carolina; November 21, 1789". The Avalon Project at Yale Law School. Archived from the original on November 23, 2015. Retrieved October 31, 2015. ^ "Ratification of the Constitution by the State of Rhode Island; May 29, 1790". The Avalon Project at Yale Law School. Archived from the original on November 22, 2015. Retrieved October 30, 2015. ^ Tindall, William (February 25, 1919). "Naming the Seat of Government of the United States: A Legislative Paradox". Records of the Columbia Historical Society. Historical Society of Washington, D.C. 23: 10–25. JSTOR 40067136. ^ Thorpe, Francis Newton (1906). The Federal and State Constitutions, Colonial Charters, and Other Organic Laws of the States, Territories, and Colonies Now or Heretofore Forming the United States of America. Government Printing Office. p. 568. ISBN 0-89941-792-2. Retrieved October 26, 2009. ^ "Jay's Treaty". Library of Congress. Archived from the original on October 27, 2015. Retrieved November 2, 2015. 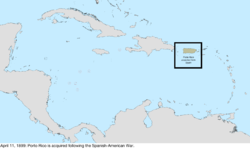 ^ "Treaty of Friendship, Limits, and Navigation Between Spain and The United States; October 27, 1795". The Avalon Project at Yale Law School. Archived from the original on November 12, 2015. Retrieved October 30, 2015. ^ "Proclamation of President Adams Accepting the Political Rights over Western Reserve". Archived from the original on June 4, 2016. Retrieved October 29, 2015. ^ "The Acts of Union, 1800". Archived from the original on September 23, 2015. Retrieved November 10, 2015. ^ Higgs, Robert. ""Not Merely Perfidious but Ungrateful": The U.S. Takeover of West Florida". Independent Institute. Archived from the original on May 23, 2016. Retrieved June 14, 2016. ^ "Proclamation—Occupation of West Florida (October 27, 1810)". Miller Center of Public Affairs. Archived from the original on October 30, 2015. Retrieved October 29, 2015. ^ Cox, Isaac Joslin (1918). The West Florida Controversy, 1798–1813 – a Study in American Diplomacy. Baltimore, Maryland: The Johns Hopkins Press. ^ Louisiana; Lislet, Louis Moreau (1828). A General Digest of the Acts of the Legislature of Louisiana: Passed from the Year 1804, to 1827, Inclusive. p. 9. Retrieved October 28, 2015. ^ a b "Detroit surrenders without a fight". The History Channel. Archived from the original on May 19, 2016. Retrieved June 13, 2016. ^ "Town History". Town of Brookville, Maryland. Archived from the original on May 5, 2016. Retrieved June 13, 2016. ^ Burrage, Henry Sweetser (1919). Maine in the Northeastern Boundary Controversy. p. 78. Retrieved June 22, 2016. ^ "Treaties in Force" (PDF). United States Department of State. Archived (PDF) from the original on May 7, 2015. Retrieved July 14, 2015. ^ Rowland, Dunbar (1917). The Official and Statistical Register of the State of Mississippi, Volume 4. pp. 57–58. Retrieved November 23, 2015. 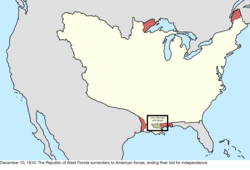 ^ a b "The United States Formally Takes Control of Florida (July 17, 1821)". State Library and Archives of Florida. Archived from the original on September 8, 2015. Retrieved July 14, 2015. 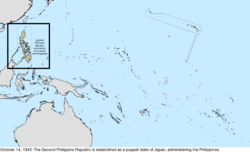 ^ "Convention Between the United States of America and His Majesty the Emperor of All the Russias, Relative to Navigating, Fishing, Etc., in the Pacific Ocean". Archived from the original on March 19, 2016. Retrieved January 3, 2016. ^ a b Keedy, Edwin R. (January 1953). "The Constitutions of the State of Franklin, the Indian Stream Republic and the State of Deseret". University of Pennsylvania Law Review. University of Pennsylvania Law Review. 101 (4): 521–525. JSTOR 3309935. ^ Foreign Office, Great Britain (1852). British and Foreign State Papers. p. 444. Retrieved June 28, 2016. ^ "The Frostbitten Convention; or, How Michigan Ended the Toledo War and Became a State". Archived from the original on August 9, 2016. Retrieved June 22, 2016. ^ "Text of "The Webster–Ashburton Treaty"". The Avalon Project at Yale Law School. Archived from the original on August 25, 2006. Retrieved August 4, 2006. 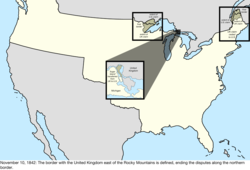 ^ "Evolution of Michigan's Boundaries: The Minnesota Sliver". Michigan State University. Archived from the original on January 8, 2016. Retrieved December 27, 2015. ^ Text from Webster–Ashburton Treaty: "till the line thus run intersects the old line of boundary surveyed and marked by Valentine and Collins previously to the year 1774, as the 45th degree of north latitude, and which has been known and understood to be the line of actual division between the States of New York and Vermont on one side, and the British Province of Canada on the other"
^ "Provisional and Territorial Records Guide – 1843 Map". Oregon State Archives. Retrieved March 12, 2016. ^ a b "A Guide to the United States' History of Recognition, Diplomatic, and Consular Relations, by Country, since 1776: Texas". United States State Department. Archived from the original on April 1, 2017. Retrieved April 3, 2017. ^ "Text of "Treaty with Great Britain, in Regard to Limits Westward of the Rocky Mountains"". The Avalon Project at Yale Law School. Archived from the original on April 19, 2009. Retrieved August 4, 2006. ^ Lavash, Donald (2006). A Journey Through New Mexico History. p. 129. ISBN 978-0-86534-541-6. Retrieved March 16, 2016. 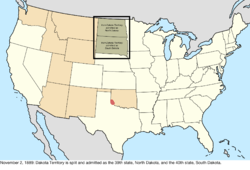 ^ "New Mexico – Laws for the Government of the Territory of New Mexico; September 22, 1846". The Avalon Project at Yale Law School. Archived from the original on April 1, 2016. Retrieved March 16, 2016. ^ "(James S. Calhoun's Annotated Copy) Map of the Territory of New Mexico Made by Order of Brig. Gen. S.W. Kearny under Instructions from Lieut. W.H. Emory, U.S.T.E. by Lieut's J.W. Abert and W.G. Peck, U.S.T.E., 1846–7". 1850. Archived from the original on August 18, 2016. Retrieved March 16, 2016. ^ Williams, J. Fletcher. Henry Hastings Sibley: A Memoir. Minnesota Historical Society. pp. 277–281. Archived from the original on March 7, 2016. Retrieved December 28, 2015. ^ Danver, Steven L (April 25, 2013). "Young, Brigham". Encyclopedia of Politics of the American West. p. 675. ISBN 978-1-4522-7606-9. Retrieved January 28, 2016. ^ Deseret (1919). Laws and ordinances of the state of Deseret (Utah). p. Prefatory. Retrieved June 22, 2016. ^ Kenneth R. Turner, "No Man's Land," Archived April 2, 2015, at the Wayback Machine Encyclopedia of Oklahoma History and Culture, www.okhistory.org (accessed June 4, 2015). ^ "Gadsden Purchase Treaty : December 30, 1853". The Avalon Project at Yale Law School. Archived from the original on May 19, 2015. Retrieved June 3, 2015. ^ Report of the Regents of the University on the Boundaries of the State of New York, Volume II. 1884. pp. 219–223. Retrieved July 9, 2015. ^ Florida v. Georgia , 58 U.S. 478, 480 (US 1854). ^ Kleber, John E. "Middleton Offset". The Kentucky Encyclopedia. p. 635. ISBN 0-8131-2883-8. Retrieved October 28, 2015. ^ "Tennessee-Kentucky border didn't turn out as straight as it was supposed to be" (PDF). Archived (PDF) from the original on March 4, 2016. Retrieved October 28, 2015. ^ a b "Departmental Manual". U.S. Department of the Interior Office of Insular Affairs. Retrieved July 15, 2016. 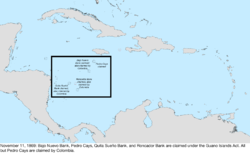 ^ "Vanishing of Sarah Ann, Tiny Pacific Island, Causes Scientists Much Worry". Washington: Lundington Daily News. October 16, 1932. p. 1. Retrieved January 13, 2010. 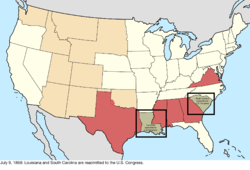 ^ a b c d e f g h i j k l m "Secession Ordinances of 13 Confederate States". University of Houston. Archived from the original on September 5, 2015. Retrieved May 24, 2015. ^ "Arizona Territory". National Park Service. Archived from the original on April 6, 2017. Retrieved April 5, 2017. ^ "Secession". John Locke Foundation. ^ "VIRGINIA. ; The Restored Government of Virginia—History of the New State of Things". The New York Times. June 26, 1864. Archived from the original on August 12, 2016. ^ Navy Dept, United States; Rush, Richard (1922). Official Records of the Union and Confederate Navies in the War of the Rebellion. p. 103. Retrieved June 22, 2016. ^ Colton, Ray Charles (1985). The Civil War in the Western Territories. University of Oklahoma Press. pp. 122–123. ISBN 0-8061-1902-0. Retrieved August 3, 2010. ^ a b c "As long as grass shall grow and water run: The treaties formed by the Confederate States of America and the tribes in Indian Territory, 1861". University of Nebraska–Lincoln. Archived from the original on October 24, 2016. Retrieved May 2, 2017. ^ a b c "Maps and History of Oklahoma County 1830–1900". Archived from the original on April 14, 2017. Retrieved May 2, 2017. ^ a b "Palmyra Atoll". Office of Insular Affairs. Archived from the original on September 10, 2015. Retrieved July 8, 2015. ^ Martis, Kenneth C., "Historical Atlas of Political Parties in the United States Congress: 1789-1989, 1989 ISBN 0-02-920170-5 p. 116. ^ a b c d e f g h i j k l m "Chronology". Historical Dictionary of the British Empire. London: Rowman & Littlefield. 2015. pp. xix–xxxviii. ISBN 978-0-8108-7524-1. Archived from the original on April 8, 2016. Retrieved July 4, 2015. ^ "Remaining Confederate Cabinet Dissolves". Kansas City Public Library. Archived from the original on March 3, 2016. Retrieved May 21, 2015. ^ Society, Nevada State Historical (1909). First Biennial Report of the Nevada Historical Society. p. 133. Archived from the original on April 18, 2016. Retrieved May 21, 2015. ^ a b c "Acquisition Process of Insular Areas". United States Department of the Interior Office of Insular Affairs. Archived from the original on August 15, 2016. Retrieved July 15, 2016. ^ Austin, Erik W.; Clubb, Jerome M. (1986). Political Facts of the United States Since 1789. Columbia University Press. p. 76. ISBN 978-0-231-06094-3. Archived from the original on May 27, 2016. Retrieved July 6, 2015. ^ "Treaty concerning the Cession of the Russian Possessions in North America by his Majesty the Emperor of all the Russias to the United States of America". The Avalon Project at Yale Law School. Archived from the original on January 29, 2009. Retrieved August 4, 2006. ^ Act authorizing readmission on ratification of 14th amendment: 15 Stat. 73. Florida ratified the amendment before that law was passed, so Florida was readmitted upon passage of the law. ^ Act authorizing readmission on ratification of 14th amendment: 15 Stat. 73. Proclamation of North Carolina's ratification: 15 Stat. 703. ^ Act authorizing readmission on ratification of 14th amendment: 15 Stat. 73. Proclamations of Louisiana's and South Carolina's ratification: 15 Stat. 704. ^ Act authorizing readmission on ratification of 14th amendment: 15 Stat. 73. Proclamation of Alabama's ratification: 15 Stat. 704. ^ Meyers, Christopher C. (2008). The Empire State of the South. ISBN 978-0-88146-111-4. Archived from the original on May 21, 2016. Retrieved May 19, 2015. ^ "Wyoming History". State of Wyoming. Archived from the original on November 8, 2015. Retrieved November 12, 2015. ^ Chisholm, Hugh (1910). "Georgia". Encyclopædia Britannica. p. 757. Retrieved July 6, 2015. ^ "Northwest Territories". The Canadian Encyclopedia. Archived from the original on June 27, 2015. Retrieved July 6, 2015. ^ "British Columbia". The Canadian Encyclopedia. Archived from the original on June 20, 2015. Retrieved July 6, 2015. ^ "Vostok Island". Historical Dictionary of the British Empire. London: Rowman & Littlefield. 2015. pp. 561–562. ISBN 978-0-8108-7524-1. Archived from the original on May 16, 2016. Retrieved July 2, 2015. ^ "Union Islands". Historical Dictionary of the British Empire. London: Rowman & Littlefield. 2015. pp. 540–541. ISBN 978-0-8108-7524-1. Archived from the original on May 6, 2016. Retrieved July 2, 2015. ^ "Flint Island". Historical Dictionary of the British Empire. London: Rowman & Littlefield. 2015. p. 191. ISBN 978-0-8108-7524-1. Archived from the original on May 12, 2016. Retrieved July 2, 2015. ^ Watkins, Albert (1913). "Nebraska Territorial Acquisition". Collections of the Nebraska State Historical Society. Nebraska State Historical Society. XVII: 53. Retrieved May 18, 2015. ^ a b "Unknown title". United Empire. Royal Colonial Institute. 4: 266. 1914. Retrieved June 22, 2015. ^ "Hawaii". Office of the Historian, Bureau of Public Affairs, United States Department of State. Archived from the original on June 19, 2015. Retrieved May 14, 2015. ^ "U.S. Insular Areas: Application of the U.S. Constitution" Archived February 16, 2008, at the Wayback Machine (pdf). Report to the Chairman, Committee on Resources, House of Representatives. United States General Accounting Office. November 1997. Page 39, footnote 2. ^ "Treaty of Peace Between the United States and Spain; December 10, 1898". The Avalon Project at Yale Law School. Archived from the original on May 23, 2015. Retrieved May 14, 2015. ^ a b c d "Treaties, Cessions, and Federal Laws". American Samoa Bar Association. Archived from the original on March 4, 2016. Retrieved May 11, 2015. 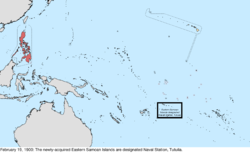 ^ https://americansamoa.noaa.gov/about/history.html National Marine Sanctuary of American Samoa. History. 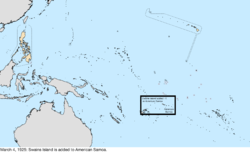 americansamoa.noaa.gov. Retrieved January 18, 2018. 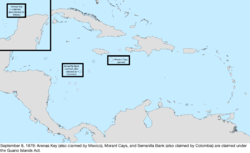 ^ "Agreement Between the United States and Cuba for the Lease of Lands for Coaling and Naval stations; February 23, 1903". The Avalon Project at Yale Law School. Archived from the original on June 4, 2016. Retrieved June 13, 2016. ^ Kramer, Paul (July 30, 2013). 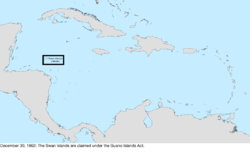 "A Useful Corner of the World: Guantánamo". The New Yorker. Retrieved June 4, 2018. ^ DuVal, Miles P. (1947). And the Mountains Will Move: The Story of the Building of the Panama Canal. Stanford University Press. ISBN 978-0-8047-1151-7. Archived from the original on April 24, 2016. Retrieved May 12, 2015. ^ Committee On Appropriations, United States. Congress. House; Tawney, James A (1908). Hearings concerning estimates for construction of the Isthmian Canal for the fiscal year 1909. Retrieved July 6, 2015. ^ Myers, Arther J.; Vosburg, David L. (November 1964). "Distances Within the State of Oklahoma" (PDF). Oklahoma Geology Notes. University of Oklahoma. 24 (11): 256. Archived (PDF) from the original on March 4, 2016. Retrieved May 17, 2015. ^ International Boundary between the United States and the Dominion of Canada through the St. Lawrence River and Great Lakes, Sheet No. 12 – Niagara River (Map). Buffalo, New York: International Waterways Commission. August 15, 1913. Archived from the original on March 4, 2016. Retrieved August 8, 2016. ^ a b c d e f g h i j k l "Maritime Boundaries". United States Department of State. Retrieved August 19, 2018. ^ "Who Owns Pope's Folly Island?". The New York Times. June 20, 1893. Archived from the original on March 5, 2016. Retrieved May 11, 2015. ^ "Manu'a celebrates 105 years under the U.S. Flag". Samoa News. July 16, 2009. Archived from the original on September 27, 2011. Retrieved May 11, 2015. ^ Bowden, J.J. (October 1959). "The Texas-New Mexico Boundary Dispute Along the Rio Grande". Southwestern Historical Quarterly. Texas State Historical Association. 63 (2): 221–237. Retrieved May 11, 2015. ^ a b c d e f g h "Formerly Disputed Islands". U.S. Department of the Interior Office of Insular Affairs. Archived from the original on March 5, 2016. Retrieved June 13, 2016. ^ "Boundary Convention". The Canal Record. Balboa Heights, Panama. June 9, 1915. Archived from the original on August 27, 2016. Retrieved June 30, 2015. ^ a b c d e f g h McCain, William D. (1965). The United States and the Republic of Panama (2nd printing). New York: Russell & Russell. pp. 144–159. ^ "Letter, Chester Harding (Governor of the Panama Canal Zone) to Luis Urriola (President of the Republic of Panama), July 12, 1918". Memoria que presenta el Secretario de Relaciones Exteriores a la Honorable Asamblea Nacional en sus Sesiones Ordinarias de 1918. Panama: Republic of Panama: 303–305. 1919. ^ "The Panama Canal Record". XIII (39). 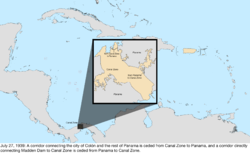 Balboa Heights, Canal Zone: The Panama Canal. May 12, 1920. pp. 584–585. 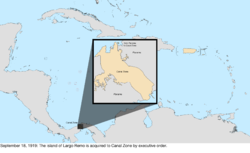 ... it was not until the year 1918, when the Governor of the Canal Zone addressed a communication to the Secretary of Foreign Affairs of the Republic of Panama stating that the United States Government would require 50.6 hectares, that the exact area expropriated was definitely known. ^ Canal Zone. Office of the Governor. (1919). Annual Report of the Governor of the Panama Canal for the Fiscal Year ended June 30, 1919. Washington, DC: U.S. Government Printing Office. p. 94. Archived from the original on May 6, 2016. A survey was made and a map drawn up showing the boundary lines of the Punta Paitilla military reservation. Various areas were determined with reference to high and low water and the old and new city boundary lines. Permanent monuments were set and a description written up by metes and bounds. A tracing was made of the map of the military reservation known as area 'A'. ^ a b Ecenbarger, Bill (August 30, 2001). Walkin' the Line: A Journey from Past to Present Along the Mason-Dixon. M. Evans and Company, Inc. pp. 89–91. ISBN 978-1-4617-1076-9. Archived from the original on April 23, 2016. Retrieved May 10, 2015. ^ "Pub.Res. 7". 1921. Archived from the original on April 9, 2016. ^ a b Hayes, J. Carroll (July 1923). "The Delaware Curve: The Story of the Pennsylvania-Delaware Circular Boundary". Pennsylvania Magazine of History and Biography. Historical Society of Pennsylvania. 47 (3). Retrieved May 10, 2015. ^ "Refuse to be Expatriated: Citizens of Delaware Decline to Become Pennsylvanians". The New York Times. December 19, 1892. Archived from the original on March 5, 2016. Retrieved May 10, 2015. ^ a b "Kingman Reef". Office of Insular Affairs. Archived from the original on August 15, 2016. Retrieved July 15, 2016. ^ Annual Report of the Governor of the Panama Canal for the Fiscal Year ended June 30, 1924. Washington, DC: [U.S.] Government Printing Office. 1924. p. 13. Retrieved July 10, 2016. ^ Exec. Order No. 4019 (June 5, 1924; in English) President of the United States. Retrieved on June 30, 2015. ^ "Pub.Res. 75" (PDF). 1925. Archived (PDF) from the original on October 30, 2015. ^ "Treaty Between Canada and the United States of America to define more accurately and to complete the International Boundary between the two Countries" (PDF). February 24, 1925. Archived from the original (PDF) on August 16, 2016. Retrieved May 8, 2015. ^ "Minute 99: Re accretions lands on Colorado River—also Farmers and Fain Bancos.Decision reached" (PDF). International Boundary and Water Commission. October 26, 1927. Archived (PDF) from the original on March 4, 2016. Retrieved January 12, 2016. ^ a b "Minutes between the United States and Mexican Sections of the IBWC". International Boundary and Water Commission. Archived from the original on July 13, 2015. Retrieved January 6, 2016. ^ Shih, Yang-Ch'Eng. American Water Resources Administration. p. 1027. Retrieved June 22, 2016. ^ The details of the project are contained in IBWC minutes 145 through 167. "Minutes 1 through 179". International Boundary and Water Commission. Archived from the original on June 16, 2015. Retrieved June 22, 2016. ^ Bevans, Charles Irving (1976). Treaties and Other International Agreements of the United States, Volume 12. Retrieved April 12, 2015. ^ "Treaty of Friendship and Cooperation" (PDF). Library of Congress. Archived (PDF) from the original on November 4, 2016. Retrieved November 2, 2016. ^ Foreign relations of the United States diplomatic papers, General, the British Commonwealth and Europe (1939). U.S. Department of State. 1939. pp. 317–319. Archived from the original on March 4, 2016. 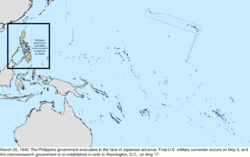 ^ a b "Japanese Occupation of Guam". Guampedia. Archived from the original on April 2, 2015. Retrieved April 12, 2015. ^ a b "Surrender of Wake Atoll, 4 September 1945". Naval History & Heritage Command. Archived from the original on October 23, 2016. Retrieved April 11, 2015. ^ a b c "71st Anniversary of the Second Philippine Republic". Republic of the Philippines Presidential Museum and Library. Archived from the original on March 15, 2015. Retrieved April 11, 2015. ^ "United Nations Treaty Series Volume 7" (PDF). Archived (PDF) from the original on September 24, 2015. Retrieved April 10, 2015. 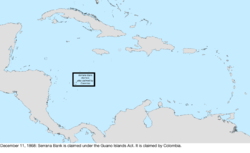 ^ "Organic Act of Guam". Guampedia. Archived from the original on April 2, 2015. Retrieved June 30, 2015. ^ Vinokurov, Evgeny (2007). Theory of Enclaves. Lexington Books, Lanham, MD. pp. 190–192. ISBN 978-0-7391-2403-1. Retrieved June 30, 2015. ^ "Boundary: Solution of the Problem of the Chamizal" (PDF). International Boundary and Water Commission. August 29, 1963. Archived (PDF) from the original on December 19, 2014. Retrieved April 9, 2015. 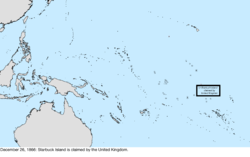 ^ "Constitution of the Cook Islands" (PDF). Archived from the original (PDF) on September 24, 2015. Retrieved July 2, 2015. ^ "Treaty on the Swan Islands" (PDF). Archived (PDF) from the original on August 21, 2016. Retrieved June 17, 2015. ^ a b Gray, David H. (Autumn 1997). "Canada's Unresolved Maritime Boundaries" (PDF). IBRU Boundary and Security Bulletin. pp. 61–67. Retrieved March 21, 2015. ^ Rohter, Larry (September 26, 1987). "South of Border Was Once North". New York Times. Archived from the original on March 9, 2014. Retrieved November 11, 2013. ^ "Completion of the Relocations of the Rio Grande Stipulated in Article I of the Treaty of November 23, 1970 (Minute No. 257)" (PDF). International Boundary and Water Commission. May 18, 1977. Retrieved April 9, 2015. 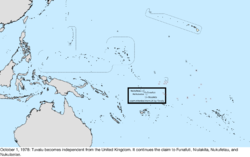 ^ "Constitution of Tuvalu". Archived from the original on August 28, 2015. Retrieved July 2, 2015. 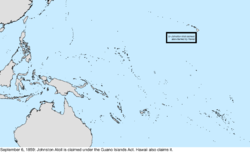 ^ "Constitution of Kiribati". Government of Kiribati. 1979. Archived from the original on September 21, 2015. Retrieved April 9, 2015. 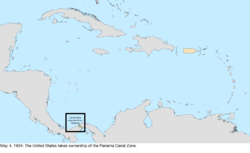 ^ "The Panama Canal and the Torrijos-Carter Treaties". U.S. Department of State. October 31, 2013. Archived from the original on November 8, 2014. Retrieved April 9, 2015. ^ "Treaty between the Government of the United States of America and the Government of the Republic of Colombia Concerning the Status of Quita Sueño, Roncador, and Serrana" (PDF). Archived (PDF) from the original on March 4, 2016. Retrieved June 17, 2015. 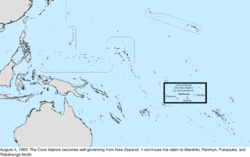 ^ "Treaty between the United States of America and New Zealand on the Delimitation of the Maritime Boundary between Tokelau and the United States of America" (PDF). pp. 251–267. Archived (PDF) from the original on March 4, 2016. Retrieved June 17, 2015. 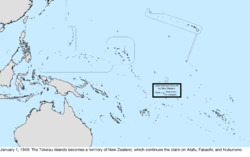 ^ "Treaty between the United States of America and the Cook Islands" (PDF). June 11, 1980. Archived (PDF) from the original on March 8, 2016. Retrieved April 8, 2015. ^ "Treaty of Friendship between the United States of America and the Republic of Kiribati" (PDF). pp. 239–250. Archived (PDF) from the original on March 4, 2016. Retrieved June 17, 2015. 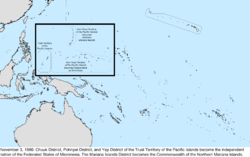 ^ "Treaty of Friendship between the United States of America and Tuvalu" (PDF). pp. 79–84. Archived (PDF) from the original on March 4, 2016. Retrieved June 17, 2015. ^ a b Ronald Reagan (November 3, 1986). 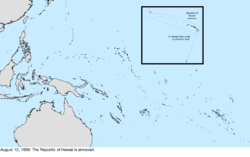 "Proclamation 5564: Placing Into Full Force and Effect the Covenant With the Commonwealth of the Northern Mariana Islands, and the Compacts of Free Association With the Federated States of Micronesia and the Republic of the Marshall Islands" (PDF). Government Publishing Office. Archived (PDF) from the original on September 24, 2016. Retrieved April 7, 2015. ^ Anderson, Jon (February 8, 1973). 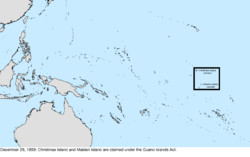 "Wake Island Claimed By Marshall Islanders". The Cameron Herald. Cameron, Texas. Archived from the original on August 19, 2016. Retrieved January 28, 2016. 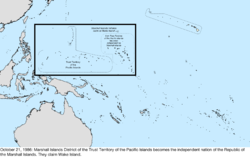 ^ "Palau Gains Independence on Saturday". Salt Lake City, Utah, USA: The Deseret News, via Google News. Associated Press. September 30, 1994. ^ "Navassa Island". U.S. Department of the Interior Office of Insular Affairs. Archived from the original on August 15, 2016. Retrieved July 15, 2016. ^ "New Jersey v. New York – 523 U.S. 767 (1998)". Justia. Retrieved August 2, 2012. ^ "Minute 315: Adoption of the Delineation of the International Boundary on the 2008 Aerial Photographic Mosaic of the Rio Grande" (PDF). International Boundary and Water Commission. November 24, 2009. Archived from the original (PDF) on April 11, 2016. Retrieved June 13, 2016. 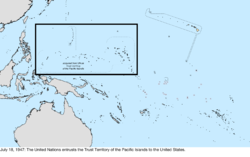 ^ "Treaty between the Government of Niue and the Government of the United States of America on the delimitation of a maritime boundary". United Nations. Archived from the original on August 21, 2016. Retrieved June 30, 2015. 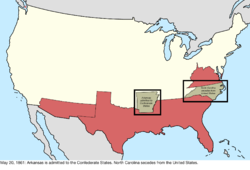 ^ "Border of North Carolina and South Carolina Realigned on January 1st". WABC. January 2, 2017. Archived from the original on January 3, 2017. Retrieved January 3, 2017. ^ "How the Carolinas Fixed Their Blurred Lines". The New York Times. August 23, 2014. Archived from the original on May 24, 2016. Retrieved January 3, 2017. ^ "Convention Between the United States and Mexico for the Elimination of the Bancos in the Rio Grande from the Effects of Article II of the Treaty of November 12, 1884" (PDF). June 5, 1907. Archived from the original (PDF) on October 9, 2015. Retrieved April 19, 2015. ^ Metz, Leon C. (June 12, 2010). "Bancos of the Rio Grande". Handbook of Texas Online. Texas State Historical Association. Archived from the original on October 27, 2016. Retrieved July 13, 2015. ^ "IBWC Minutes". International Boundary and Water Commission. Retrieved September 11, 2017. ^ "USA-Mexico Bancos Map". Retrieved September 11, 2017. Van Zandt, Franklin K. (1976). Boundaries of the United States and the Several States: With Miscellaneous Geographic Information Concerning Areas, Altitudes, and Geographic Centers. Washington, D.C.: U.S. Government Printing Office. OCLC 69426475. Stein, Mark (2008). How the States Got Their Shapes. New York: Smithsonian Books/Collins. ISBN 978-0-06-143138-8. OCLC 137324984. Walker, Francis A. (1874). Statistical Atlas of the United States. pp. 65–79. Retrieved April 3, 2019.